Every prepper knows that when disasters occur, you are on your own. If you run of water, in 72 hours, you will die or have severe dehydration. This book deserves a place on your library shelves and can provide essential knowledge on what to expect when disasters take out our municipal water supply. I realize the title of this article is grim, to say the least, but deaths due to dehydration or poorly treated water are 100% avoidable, if you have preparations in place. We tend to take for granted how readily available our water sources are. Simply turning the knob, we have water. But all of that changes when emergencies occur. Our municipal water sources quickly become contaminated for days or weeks following a disaster. As well, those who plan for emergencies usually follow recommendations from disaster organizations suggesting 1 gallon of water per person/per day. If we go by this suggestion, a family of 5 will need 35 gallons of water per week to survive a disaster. This is a gross underestimation that could cause life threatening issues if you run out and something that author, Daisy Luther discusses in her book, The Prepper’s Water Survival Guide. 1 gallon of water per person/per day is the minimum amount of water a person needs. This is strictly for drinking purposes only and does not take in account any sanitation needs, medical needs, etc. Victims of previous disasters say the suggested water amount provided by disaster organizations is not enough to get through a disaster. Many families use four times as much water in disasters. Luther’s book takes these common misconceptions into account and goes into detail on what to expect when water sources are questionable. 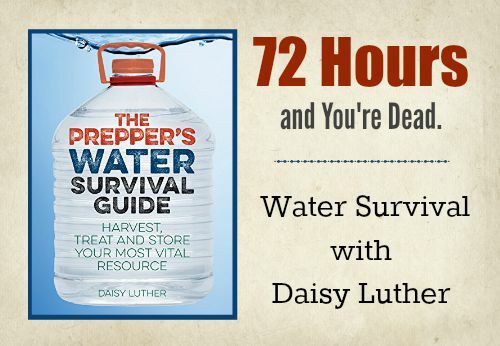 Daisy Luther was kind enough to answer a few questions about her book and shed some light on how to start prepping your water stores, as well as which types of disasters typically cause water contamination. This interview could save your life in a disaster and make your family or group more organized in planning for this prepping necessity. You have written three well-received books in the last three years, can you tell us a little about them? Yes! First there is The Pantry Primer: How to Build a Whole Food Pantry on a Half Price Budget. This book is about the importance building your stockpile from nutritious foods instead of highly processed items. There are lots of tips about how to do this on a strict budget. Secondly I wrote The Organic Canner, which is a collection of my own personal canning recipes. The book contains everything from directions for preserving individual ingredients to fancy jams to meals in jars. And most recently is The Prepper’s Water Survival Guide, which is about all things water. Your most recently published book, The Prepper’s Water Survival Guide: Harvest, Treat, and Store Your Most Vital Resource is about the importance of water in a survival situation, why did you decide to write about water? If you really aren’t into prepping, but wish to do one thing to ensure the safety and comfort of your family, clean potable water is that thing. It truly is the most important prep. In the book, I like how you touched on the contaminations and toxic substances that can leach into our municipal water supplies following a disaster. When we were living through the aftermath of a hurricane, my family also had to deal with our water sources being questionable. What type of disasters would this likely cause this to occur? Many different disasters can affect the municipal water supply. For example, in areas stricken by wildfires, the tremendous amount of ash in the air can get into supplies. Earthquakes can cause breaches that allow contaminants to get in the water. (Actually earthquakes can also affect well water and you should always test your well water after one.) Floods can cause all sorts of contaminants to get into the water supply as things get swept along by the flood waters into the supply. If you don’t have running water, what do you do? Hopefully, you’ve stored water for just such an event. We always have drinking water as well as water for flushing, since we are on a septic system. Having water for cleaning or using secondary sanitation methods like cleaning wipes is also a good idea. From your experience, what is the best approach for preparing water stores? The majority of our water storage is in 5 gallon jugs filled with purified water. We also fill 1 gallon jugs with tap water for cleaning, pets, and sanitation needs. Throughout the book, you emphasized how poorly treated water will be a dominant cause of illnesses following a disaster. What supplies would you recommend for water treatment and what are the most likely water-borne diseases to look out for? Poor sanitation is what normally taints the water in the aftermath of a disaster. It only takes one person improperly handling waste to contaminate the supply for thousands of people. Unscented bleach or pool shock is the best way to treat your water (and the least expensive.) We also have several different high quality filters. It would be difficult to diagnose, without medical tests, which type of waterborne illness a person has. It’s best to seek medical attention, but if that is not possible, you may have to treat them at home. NEVER give a person with a water-borne illness anti-diarrheal medication – it can make some illnesses worse, or even deadly. Keep the person hydrated with fresh untainted water. Can you give some tips on how much water supplies are needed? For drinking water, the rule of thumb is 1 gallon per person per day. People often think that’s all they need, but they aren’t taking into account sanitation needs like washing hands, washing dishes, personal hygiene and surface hygiene. That brings your total to additional 5 gallons per day, for a ballpark idea. What are you favorite short-term and long-term ways to store water? As mentioned above, I use the 5 gallon jugs for drinking water and 1 gallon jugs for sanitation. For short term supplies, I’m a huge fan of the water bob, which you use to line your bathtub and store tap water. Many preppers are purchasing 50-gallon rainwater collection systems, what are your thoughts on this? These are fantastic as long as they are handled correctly. The top needs to be screened to keep mosquitos from laying eggs. If you’re using the water outside or for animals you’re good to go. If you are using it for drinking, you will need to purify and filter it. What 5 tips can you offer on how to conserve water? Don’t leave the taps running when brushing your teeth or washing your face – this wastes up to 4 gallons per minute! In a scenario where supplies are limited follow the old “If it’s yellow let it mellow” adage for toilet flushing. Don’t rinse dishes under running water. Use a basin or a sink. Collect the water you run while waiting for it to get hot or cold. Use this to water pets or plants, or to fill the coffee maker. Instead of watering your garden with a sprinkler, deeply soak the roots of the plants for more efficiency. Every prepper knows that when disasters occur, you are on your own. If you run out of water, in 72 hours, you will die or have severe dehydration. This book deserves a place on your library shelves and can provide essential knowledge on what to expect when disasters take out our municipal water supply. What I like most about her book is how detailed it is about the different types of water-borne diseases and how to avoid them. She also lists some great water storage suggestions that you may not have thought of. As well, her tips on water conservation will help you make the most of the water you have. Daisy has done her homework on this subject and will show you the ins and outs of water preparedness. Copies of The Prepper’s Water Survival Guide are available on Amazon. who drinks a gallon of water a day?! Depends on your activity level, you may need more how ever you do aquire hydration from some foods you eat fruit for example. But basic rule of thumb to stay properly hydrated is 1 gal a day basicly if you arn’t peeing every couple of hours you should drink more water. By the way i do drink a gal a day to answer your question rich.